Posted on Sun, Feb 26, 2012 : 5:58 a.m.
Kentaro Roy, a business student at Eastern Michigan University, is also the founder of Kentaro Web Consulting. Starting a successful business, turning a profit within a year and earning enough money to establish a scholarship at your alma mater are rare enough accomplishments for alumni of a college of business, but they’re even more unusual for a student who hasn’t yet received a diploma. However, one Eastern Michigan University College of Business student, Kentaro Roy, has done just that. 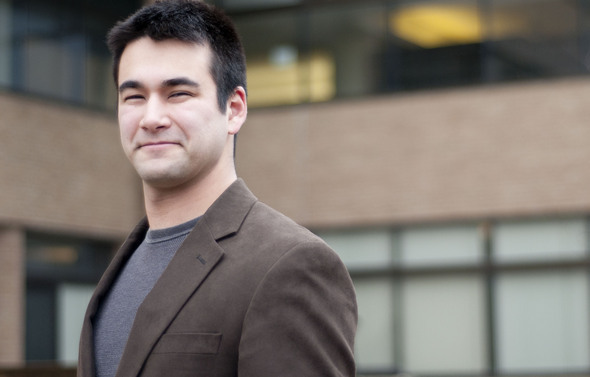 In addition to studying full time at EMU, Roy is also the founder of Ann Arbor-based Kentaro Web Consulting. He brought in about $150,000 in one year and went from a one-man operation to having four employees. Roy explained that the business, which has an office in downtown Ann Arbor, provides two main services. It helps redesign websites, then ensures the websites get in front of potential clients and customers. “We feel a lot of companies are doing one or not the other, so we help out on both of these fronts,” Roy said. Ypsilanti’s Michigan Ladder Company, the nation’s oldest ladder manufacturer, contracted with Roy's company to redesign its website. Search engine optimization and online ad management are critical to customers getting more exposure, Roy said, adding that the first two links to pop up on a web search pull in 66 percent of the traffic. “It makes a lot of sense to be high on the search results," he said. Several years ago, he was working with Keller-Williams Realty , doing offline marketing, such as mailing out filers, when he noticed a need for online marketing services. After researching how to market his office and successfully doing so, Roy began taking on other real estate clients, and the business has continued growing. He started offering his services on a freelance basis, hired his first employee in January 2011 and, over the course of the year, grew his sideline into an agency, continuing to take a full course load at EMU the whole time. When asked why he thought his web consulting business was so successful, Roy said he identified a service gap and decided to fill it. Wanting to give back to the university, the 20-year-old funded a new annual $500 scholarship this year at EMU for the Information Assurance program within the College of Technology. She said Roy planned to fund a scholarship for at least the next three years but the hope is to make it an ongoing endowed scholarship as his business grows. “He’s playing a ‘pay it forward’ role, and I’m certainly hoping other students and alums would contribute to that effort, not just in information assurance but in a lot of our programs,” Stremich said. Roy said he chose the information assurance program because it has expanded a lot in the last three years and doesn’t have a lot of funding or resources for students yet. Roy is technically in his final year of courses for his bachelor’s degree but said he might stretch out getting his diploma for another year or so because he’s too busy with his consultancy to take on too much at school. Sarah Rigg is a freelance writer and frequent contributor to AnnArbor.com. You can reach her at sarahrigg@yahoo.com. Tom Perkins is a freelance reporter for AnnArbor.com. Sun, Feb 26, 2012 : 7:49 p.m.
Forgive me, but how did all this Craig's List stuff get involved here in this story about a bright young entrepreneur? It seems irrelevant to me, but perhaps I'm missing something. These comment sections should not be a place to air personal grudges and obsessions on what seem like non-relevant issues. Sun, Feb 26, 2012 : 4:41 p.m.
Sun, Feb 26, 2012 : 12:44 p.m. He is quite the entrepreneur. I at first wondered if he was an older student but no, just 20 years old. He must have started out with Keller Williams as a teen, perhaps "several years ago" could even mean he was a subcontractor as a 14 or 15 year old, earning money since he was too young to get be formally hired. Impressive. From that he noticed a marketing void and filled it. I went and looked at his website and that of Michigan ladder, a firm that one of my MBA professors talked about, and was impressed. Best of all, he is already giving back to EMU! !